My extended backyard ranges from Silver Creek Preserve to the south and the Redfish Creek Drainage to the north. America affixed rather lofty name designations to these locations – Fisherman’s Paradise and Shangri-la – respectively in the 1930’s. Today the designations remain appropriate. I visit the Silver Creek Preserve and the Redfish Creek Drainage often throughout the year – sometimes both in the same 24-48 hour period. 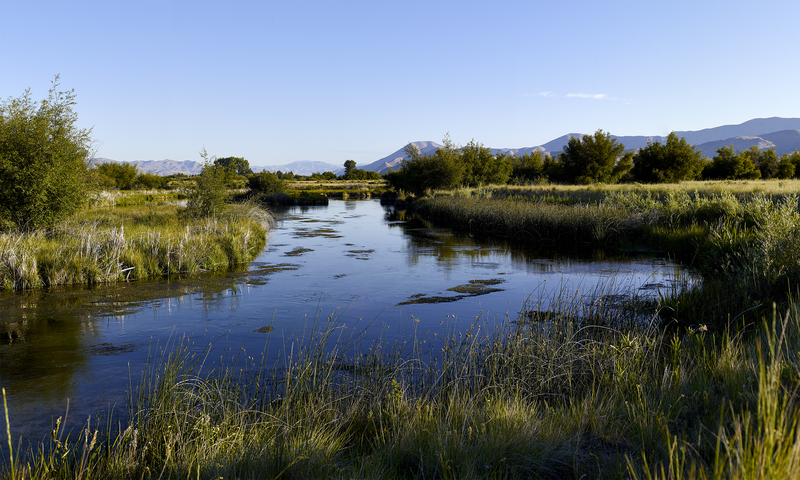 Considered by many to be the world’s premier Trout fishing location, the Silver Creek Preserve is also a great spot to sit-down, sit-back and observe. Silver Creek Preserve at sunrise. Copyright Jeffrey H. Lubeck – All rights reserved. Moon-set (Full) and sunrise of Monte Verita, Warbonnet, and Baron Lakes from The Top of The Divide. Copyright Jeffrey H. Lubeck – All rights reserved. For Saturday, the plan is to start the day by reviewing observations of the Michigan State University Basketball practice from Friday (as reported by Joe Rexrode). Next is printing and framing a working prototype of Silver Creek from the day before, visiting with patrons of the MESH Art Gallery and then heading north to the Sawtooth Wilderness for a shoot from atop the Baron Divide. The shoot requires covering about 20-25 miles and 6,000 vertical feet of gain in the round-trip. 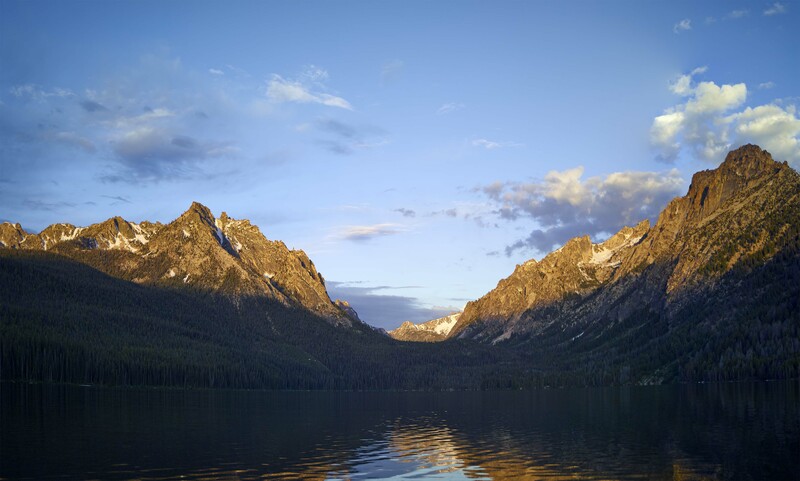 I have made the choice of allocating 18 hours for the shoot – between leaving my boat at the end of Redfish Lake and returning to pick up Linda at the dock between 11:30AM to 12 Noon on Sunday. Darn those allocations… With somewhere north of 60+ pounds on my back this could be a real push. Sunrise on the Redfish Creek Drainage from The Top of The Divide. Copyright Jeffrey H. Lubeck – All rights reserved. Thanks to my calculations of the angles of the Moon and Sun (and the fortitude/stupidity to be sitting at the top of the Baron Divide before sunrise) I get shots of the full moon setting and the sun rising from the top of the Baron Divide. Sitting just a shade below two miles in the sky, the view is 360 degrees, so I turn around and capture the Redfish Drainage within a few moments as well. Although it is the middle of July, snow almost always remains on the north-slope of the Baron Divide – and this year is no exception. I meander (albeit) carefully down to the lakes working around the snow – knowing I must regain 1,500 vertical feet back to the divide. The setting is awesome. I grab some shots. I look at my watch and determine I have to regain 1,500 vertical feet and traverse about 9 miles of up-and-down in wilderness back to the boat at the end of Redfish Lake in 3 hours (including making camp fit back into my bag). I can do this – especially if a cup of Joe is purloined into my trusty 1992 National Championship Husky (Washington) Mug and is consumed while wearing my 100th Rose Bowl Football Championship Michigan State T-shirt, under my 2007 MSU Hockey National Championship T-Shirt, which sits under my 2000 MSU Basketball T-Shirt. It is written! Sunrise on Redfish Lake Independence weekend 2014 taken by Jeff and Kyle. During the return, the heat of the day presents itself quickly. By the time I get back to Redfish Lake the temperature is 92 degrees Fahrenheit. I traverse the length of the lake quickly in my boat and arrive at 12:18PM. Linda is sitting on the dock taking in the sun. She treats my tardiness as a rounding-error. Linda has brought a tasty lunch. She also takes over as captain of the boat and we head back to the other end of the lake for a picnic in the cool shade. Seeing that a sunny cloudless sky at almost 7,000 feet elevation and 92 degree heat can be a rather toasty environment – one, two and even three dips into the lake are warranted. Nice pics. Note how low Silver Creek is. I stopped going down for fishing due to the low water. Let’s get together for a golf game one of these days. Let’s make sure we do that. It was great to see you at the baseball game honoring Larry yesterday. He deserves so much more thanks, but let’s not let him know that! Spectacular shots. Early mornings rewarded and time well spent; resulting in a bounty of captured moments. Yes the rewards are high. Another early AM award. While hiking with Linda early this AM, we ran into Ted Crary (MSU 1963 Basketball and Track). Ted is a member of the MSU Hall of Fame. First 1,000 point scorer in MSU basketball history. I met Ted about five years ago. He and his wife have had a home here in SV since the 1990s. He lives in Charlotte NC. Jeff, these are absolutely beautiful. Breathtaking! My hope is that one day I will get to share those views with you. Note see Spartan story above! camp-out and photo shoot. The Wildflowers were extraordinary – only Spray Park on its best day would be equal. 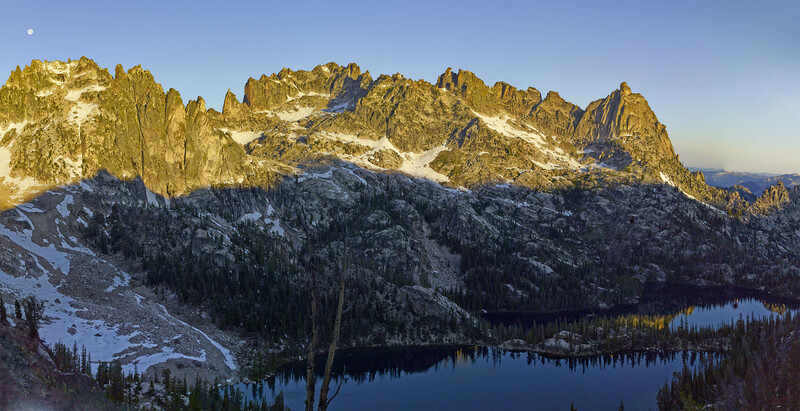 I thought about the Sunset/Sunrise/Moonset at Suchia Island Marine Park and this hike while descending back to Redfish Lake. Thanks and great to hear from you. Now if I could get a pilot to drop me into these spots.